The goal of this presentation is to give a thorough overview of the shale oil production in the US, and to answer many kinds of questions, for example where, and how much is produced, and how the quality of shale wells has changed over time and place. Within this presentation you can see the total oil production from 30533 selected horizontal wells, in the 4 most prolific US shale oil basins, that started flowing since 2007, up until November 2015. These 30533 wells have produced so far in total 3.47 billion barrels of oil, or on average 114 kbo (thousand barrels of oil) per well. This only counts production so far, and is not the final tally. I estimate that these wells have produced in excess of 2/3rd of the shale oil produced so far in the US over the last decade. In 2015, until November, these wells produced on average 3.14 mbo/d (million barrels of oil per day), which, taking the EIA numbers, represents about 42% of Lower 48 onshore production. To include one financial measure, a very rough estimate of $8-10 million in costs to drill and complete the average well in this set, would mean that the total capital expenditure on these wells may have been somewhere around the $250-300 billion range. If someone has a better estimate, based on a comprehensive review of financial statements of these operators, please share this. As you can see in the above graph from the blue area, production from wells that started producing in 2015, contributed 1.27 mbo/d by Nov, or 42% of total oil production from these wells in that month. By changing the “Group production by” function to different settings, e.g. “Basin” or “Formation”, you can view this production from different perspectives. If you click on the “Location of the shale oil basins” tab on the top, you can see where these wells have been producing, and what the most prolific counties have been so far. The “Well quality” tab shows the average production profile of all selected wells. Interesting here to see is that there was a marked improvement of wells that started producing in 2008, over 2007, but that since that time the well quality has stagnated or even deteriorated. This is of course over the whole population of wells, and there are major differences over the different basins, operators, etc. There are filters which allow you to further zoom into certain groups of wells. If you use the filters to exclude the Bakken basin, you see that there has been some improvement in well quality in the other basins. The same overview also shows that (again for the whole population of wells) although on average newer wells have been producing more in the initial 10 months, the following decline has been steeper, resulting in very similar tails as earlier wells. By changing the “Group wells by” to counties or operators, you can quickly identify the best/worst performers in each category. If you scroll to the right, to the “Well status” tab, you can when these wells started to produce, and the percentage of wells that produce a certain amount. If you click on “First flow” in the legend, and then select “Keep only”, you can see over time how many new wells were brought online. This makes the sharp drop over 2015 visible. In the same tab, in the bottom graph, you can see that in early 2012, 29% of these wells were producing less than 50 bo/d, but that this percentage has grown in recent years, and was 43% by Nov 2015. I have not included any financial considerations in these remarks, e.g. there are differences in well costs both in time and in place. Also note that if operators have performed work on an existing well, which caused this well to produce more, e.g. refracking, or the installation of pumps, then this new production is still attributed to the original well. This leads to a somewhat smaller decline rate shown in the graphs, compared with the natural decline rate of these wells. Texas RRC. For a discussion on the limitations of this data, see my recent comment in the latest Eagle Ford update. These 30533 wells include almost all horizontal wells in North Dakota Bakken, in Weld county in Colorado, the largest 2 oil producing counties in New Mexico, and all horizontal wells (in oil leases) in the Eagle Ford. It also includes the majority of horizontal wells in the Permian, but still a substantial number are excluded, as described in the above note about the Texas RRC data. Note that all data is still subject to future revisions, especially from the last few months. On the 15th of April, I will have another update on the Bakken. The statistics here do not include condensate production, except in North Dakota (I am not sure about the Niobrara), it may be that there is little condensate production in North Dakota as their focus there is oil and not natural gas. 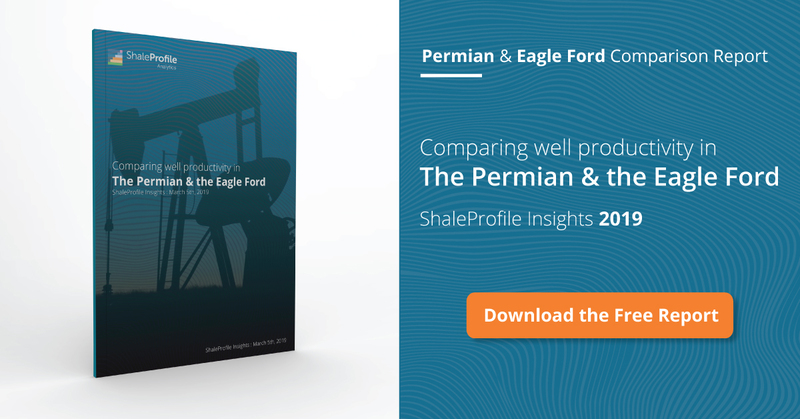 For the Eagle Ford in particular there is about 20% of C+C output which is condensate from natural gas wells. When we add in the extra 300 kb/d of condensate from the Eagle Ford, the peak in March is about 3500 kb/d, the condensate from the Permian basin is not as significant for the 12 months ending in Sept 2015 the average was 3.2%. Very nice graphic on the four counties. Is there an estimated total acreage position for this study? No, I haven’t looked at that yet. But outside Texas there is data available on the number of square miles covered by these wells. I may have a look at this more closely in the future.